On your wedding day, all eyes will be upon you. If you’re getting married soon, you’ve probably been imagining how you’ll look as you walk down the aisle in your wedding dress. Of course, you’ll have been thinking about your hair. Your hairstyle is an essential part of your bridal look. Here are some tips for making sure your hair is perfect on your big day. Start thinking about your hairstyle as early as possible, preferably months before the wedding. Book an appointment with a wedding hairstylist as soon as you can. This will give you and your stylist time to try different styles and see what works and what doesn’t. If you’re planning on colouring or perming your hair, do it at least a month before the wedding. This will allow enough time for your style to settle or for you to correct any disasters. Take time to look through bridal magazines and find some styles that you like. Then cut them out to show your stylist. Be realistic. If the model has thick, long curly hair and a round face, and you have sharp, high cheekbones, thin hair and a pixie cut, her style might not be right for you. If you hate the way you look with your hair up, you don’t have to wear an up-do. If you prefer your hair tight and controlled rather than loose and gentle, you can choose a more sculpted style with heavier products. Pick a hairstyle you’ll feel comfortable and confident in throughout the day. It’s fine to experiment with a new look, but make sure you have enough time to try it out so you can be sure it’s right for you. Think about your dress, your headpiece and your jewellery. Will they complement or clash with your hair? If you wear your hair up with a backless dress, you’ll be showing lots of skin. Will you be comfortable with that? You can help your stylist by showing her a picture of you in your wedding dress with any accessories you plan to wear on the day. It may be rainy or windy on your wedding day. You may be twirled around on the dance floor. Don’t expect your hair to look exactly the same at the end of the day as it did right after you had it done. You want to look joyful and exuberant at your wedding day, not like you’re worried about someone touching your hair. Gorgeous hair doesn’t get that way overnight. If you’ve been neglecting your hair so it’s dry and damaged, you won’t be able to get it back into perfect shape the week before the wedding. Keep using nourishing shampoos, conditioners and styling products. You can buy healthy, revitalizing products at our salon on Gandy Street. Continue getting regular haircuts so your hair stays healthy and bouncy. You and your wedding hair stylist are a team. Tell your stylist exactly what your dreams are for your hair. 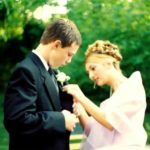 Show her photos of wedding hairstyles you love. Tell her which styles make you feel beautiful and which ones make you feel awkward. In return, listen to your stylist’s advice on which styles best suit your hair, your face and your dress. You can depend on our wedding stylist here at our Exeter salon to give you gorgeous bridal hair. Why not give us a call, if you’re looking for Wedding Hair in Exeter then you’ve come to the right place! Call us now for a consultation on 01392 499162. We are the Exeter Wedding Hair specialists!